Successfully marketing and selling a product is just one part of running a business. Companies, and the decisions that they make, are based on a variety of factors. No business operates in a vacuum. Regulations and taxes shape the business environment and can have a big influence on investment decisions. Recent changes in tax policy have given business owners a reason to invest in their buildings sooner rather than later. 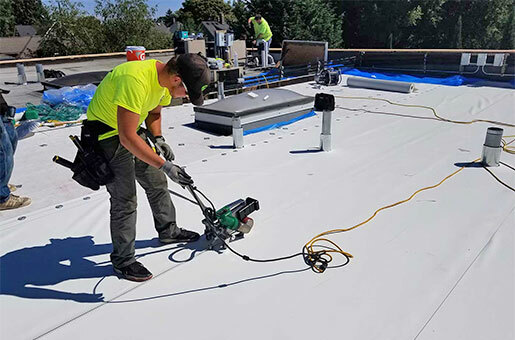 In the area of roof replacement, new tax laws allow business owners to take a deduction for the FULL AMOUNT of the new roof the year that it is installed (click here to read more). This is a dramatic change from the previous law which required owners to spread the deduction out over many years at a depreciating rate. Historically, the period of depreciated deduction outlasted the roof itself! This new policy encourages infrastructure improvement and makes 2018 a very favorable time for roof replacement. Savvy business owners have already scheduled new roofing projects with HKC, and the number is growing every day. As our schedule fills up, new bookings may be pushed into 2019. If you are a business owner in the market for a new roof, the time to act is now. Future tax policy is always uncertain, so take advantage of this unique investment opportunity to make this year a profitable one.